Demand for synthetic lubricants and functional fluids in the US will rise 5.5 percent per year to $5.7 billion in 2020. Engine oils will continue to comprise the largest product category and will undergo the most rapid change, mainly in synthetic engine oils for the light vehicle market, which is shifting toward very low viscosities in new vehicles based on automaker recommendations. Demand growth for Group III oils will exceed other synthetic basestocks due largely to their strength in the engine oils segment. 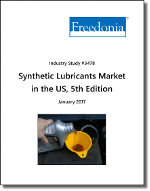 This Freedonia industry study assesses the $4.3 billion US market for synthetic lubricants and functional fluids. It presents historical demand data plus forecasts for 2020 and 2025 by product, material, and market. The study also analyzes company market share and offers competitive analysis on industry players including AMSOIL, BP, Chevron, Dow Chemical, Eastman Chemical, Exxon Mobil, Old World Industries, Prestone Products, Shell, and Valvoline. This study covers the US market for synthetic lubricants and functional fluids. Formulated products covered include engine oil, engine coolant, transmission and hydraulic fluid, heat transfer fluid, metalworking fluid, electrical oil, and others such as gear oil, compressor oil, and turbine oil. Synthetic basestocks covered include glycols, polyalphaolefins, esters, Group III base oils, aromatics, silicone fluids, and others. Markets for synthetic lubricants and functional fluids include motor vehicles and off-highway equipment, metal processing, energy and power generation, industrial equipment, process industries, aerospace, and others. Functional fluids comprise all fluids used primarily for their mechanical, lubrication, electrical insulation, or thermodynamic properties. The scope of the study is restricted to products that are liquid under standard conditions; that is, gases (such as refrigerants) and grease are excluded. Examples of functional fluid applications include hydraulic power transmission, lubrication, and heat transfer. Product ingredients (e.g., process oils), fluids consumed in use, and reagents in chemical processes (including solvents) are not included. Additionally, when reference is made within this study to total consumption of synthetic and non-synthetic functional fluids in order to place synthetic products within the context of their broader market, air, gases, steam, and water are excluded from such consideration.